I am no sun worshipper. To graduate from the Marine Corps Recruit Depot Parris Island in South Carolina, however, I did adapt to the summer heat. After boot camp, I was glad to be in the shade again. So I admire people who take the heat--literally and figuratively--every day in the Southern United States, the hot spot domestically for HIV/AIDS. It is no exaggeration to say that the South, on virtually any bad HIV/AIDS statistic you can think of, is sadly at or near the top of the list. Despite the heat, there are bright spots in the fight against the virus in the South. A peer-to-peer program at AIDS Alabama called Living Well is one excellent example. The program employs HIV-positive advocates to help break down barriers to care and treatment for fellow HIV-positive people. 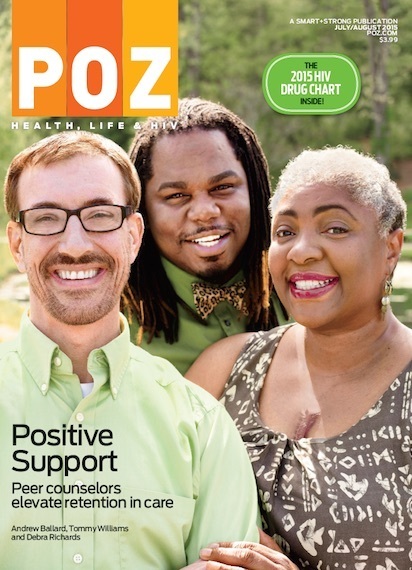 Three of these peer advocates grace our cover--Andrew Ballard, Debra Richards and Tommy Williams. Their journeys living with the virus are in themselves inspiring, but their commitment to helping others with HIV/AIDS is uplifting. Click here to read more on them and the Living Well program. Another great example of peers helping peers is the Mississippi HIV/AIDS group A Brave New Day. Robin Webb, the executive director, has been living with the virus since 1988. He founded the group to organize and empower his HIV-positive peers, which he continues to do every day. In addition to his advocacy in Mississippi, Robin also is a member of two groups that work on the big topics facing the region as a whole. They are the Southern AIDS Strategy Initiative and the Southern AIDS Coalition. Click here for our Q&A with Robin and some solutions to the broader barriers. Nic Carlisle, the new executive director of the Southern AIDS Coalition, is HIV negative. However, he has been deeply affected by the virus, losing two uncles--one in 1988 and the other in 1992--to the disease. Ever since, he has been committed to the fight against HIV/AIDS. Click here for more. The challenges people with HIV/AIDS are facing in the South are as varied as the people themselves. Kristopher Sharp, a young HIV-positive advocate in Texas, went from homelessness to college. Click here to read his story. Also from Texas is Venita Ray. Click here to read about her advocacy as an HIV-positive African-American woman. In all these stories, race and sexual orientation are addressed. Ethnicity and immigration are added to the mix in the story of Marco Castro-Bojorquez. Click here for details about how he is forming a network for HIV-positive Latino immigrants. We also explore more global concerns in this issue. Click here to read about questioning the use of taxpayer dollars to fund faith-based groups to fight HIV/AIDS. Click here to read about Life Ball, one of the largest HIV/AIDS fundraisers in the world.